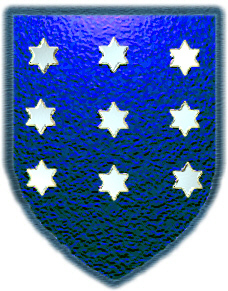 Blue with nine silver stars. Crest: A black boar's head. 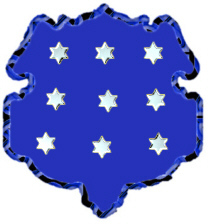 Motto: Ubi bene ibi patria. Motto Translated: One's country is where one is well. Spelling variations include: Baillie, Bailey, Bailie, Bayly, Bayley, Bailley, Baly, Ballye, Bayllie and many more. First found in county Down. Spelling variations include: Baillie, Bailey, Bailie, Bayly, Bayley, Bailley, Baly, Ballye, Bayllie and many more. BAILEY (British) meaning: "Bailiff, crown official or keeper of a royal building". First found in Northumberland where they were seated from very early times and were granted lands by Duke William of Normandy, their liege Lord, for their distinguished assistance at the Battle of Hastings in 1066 A.D. Some of the first settlers of this name or some of its variants were: Mary Bailey, who was listed as being in Virginia in the year 1619, Jonas Bailey, who was recorded in Maine in 1634, James Baillou who settled in Georgia in 1733 with his wife and son, Elizabeth, Mathew, Matty, Stewart, William Bailie, who all arrived in Philadelphia in 1804. John, Joseph, Mathew, Robert, Samuel, Thomas, Walter, William Bailey, who arrived in Pennsylvania between 1770 and 1840. Several of the name came to Newfoundland. Among them were Richard Bayly, who settled in Bay de Verde in 1675, John, who arrived in Barrow Harbour in 1676. My married name is Bailey. I have some information about my husband's (Richard) ancestors. It says under origin: Following the Anglo-Norman invasion of Ireland in 1170 many English, Welsh and Scottish families setteled in Ireland and it's among these settlers that the ancestors of the Bailey's are to be found. Territory:Today the surnames Bailey and Bailie are noted throughout Ireland, and are well represented in Antrim, Down, Dublin, Tipperary and Wexford. The name is on record in the southern counties of Ireland since the thirteenth cnetury. In some parts of Ulster, natably in Down, Cavan and Fremanagh, the Baileys are descendants of seventeenth century Scottish settlers who came originally from Lanarkshire, Renfrewshire, West Lothian anf Inverness. The town of Bailieborough in Cavan takes its name from one such settler: William Bailie of Finlayston in Renfrewshire who acquired lands in Clankee in 1610. Elsewhere in Ireland the Baileys are often descended from later English settlers. Meaning: The surname is generaly derived from the Old French word 'bailli' denoting bailiff, magistrate or sherrif in charge of a territorial district. In some cases the name may indicate one who dwelt by a bailey or castle wall. Bailie is generally a Scottish form of the name, and other varients include Bayley, Bayly, and Bailey. Ancestors: Early bearers of the name in England and Scottland include a roger le Bayllt of Suffolk (1230) and a William de Bailie of Lothian (1327), white Irish records list a William le Balliff and a Thomas le Baylyf around 1290. Catherine Bailiff is recorded 1586, Patrick Bayliff in 1599 and Shane Bayley on 1601. John Bailey, a weaver by trade, is recorded in 1635 and Richard Bailey was servant in 1638. Robert Bailey (died 1650) was a cromwellian colonel in Ireland, and a Charles Bayly studied at Trinity College in Dublin in 1682. Coat of Arms: On a field of ermine, a type of black-spotted white fur traditionally denoting nobility, dignity and honour and reward, and the beneficent province of God in times of hardship. The following article is a story about our first Bailey ancestor that came to America in 1635 - and as circumstances would have it, his ship, the 'Angel Gabriel' shipwrecked off the coast of Maine. Fortunate for us, he and his 21 year old son, John II, survived the raging storm and shipwreck and settled in Massachuetts. "John Bailey was a weaver by trade and came from Chippenham, Wilts, England. He, with his oldest son, John, came over in 1635 in the ship Angel Gabriel, sailing from Bristol, with the expectation of making a home in New England and then sending for his wife and other children, or going back to fetch them over. Unfortunately, he had a terrible experience in the great storm of August 15, 1635, and was shipwrecked off Pemaquid, now Bristol, in Maine. [See website at:http://members.aol.com/dcurtin1/gene/gabriel.htm] This storm was probably the worst storm which has ever visited the New England coast. It is said that ship timbers and other wreckage were washed far up the slopes of Old Town Hill in Newbury and could be still seen there in the last century. In Narragansett Bay, the tide rose fourteen feet higher than ordinary and whole villages of Indians were drowned in their wigwams. That John Bailey never again dared to trust himself on the ocean may be readily understood. He was, perhaps, unwise in writing his family about his misadventure, if it was indeed the fear of the passage that deterred them from joining him. At all events they never came, although constantly urged to do so. John Bailey, with his son, John, a youth of twenty-two, found their way from the inhospitable shore on which they had been cast to Newbury, and joined the little settlement at Parker River. For only two years did he abide here, and then went in 1637 further into the wilderness, taking with him one William Schooler as a helper, and built a log cabin on the further side of the Merrimack near the mouth of the Powow River. The ruins of an old cellar on what is known as Bailey's Hill can still be discerned. The land on which it stands, a tract of about fifty acres, triangular in shape, running to the Merrimack on the westerly side, and to the Powow on the northerly side, is clearly traced by recorded deeds back to the solitary settler who was pioneer of this section of the Merrimack country. A serious trouble came to this well meaning and honest forebear of yours. On June 6, 1637, he and William Schooler were arrested for murder and tried at a Court held at Ipswich. At the trial it was demonstrated that John Bailey had naught whatever to do with the murder, and he was discharged. I will give the story of the murder in the words of Governor Winthrop: "July 28, 1637. Two men were hanged at Boston....William Schooler was a vintner in London, and had been a common adulterer (as himself did confess) and had wounded a man in a duel, for which he fled into the Low Country, and from thence he fled from his captain and came to this country, leaving his wife (a handsome, neat woman) in England. He lived with another fellow at Merrimack, and there being a poor maid at Newbury, one Mary Sholy, who had desired a guide to go with her to her master who dwelt at Pascataquack" (Portsmouth) "he inquired her out and agreed for fifteen shillings to conduct her thither. But two days after he returned, ad being asked why he returned so soon, he answered that he had carried her within two or three miles of the place and that she would go no further. Being examined for this by the magistrates at Ipswich and no proof found against him, he was let go....The body of the maid was found by an Indian about half a year after in the midst of a thick swamp ten miles short of the place he said he left here in ...Whereupon he was committed, arraigned and condemned by due proceeding .."
Governor Winthrop reviews the evidence, which is hardly sufficient to sustain the verdict. In 1639 "the other fellow at Merrimack," your ancestor, John Bailey, was again in trouble. He was brought before the Court and fined five pounds, a very heavy fine, "for buying lands of Indians without leave of court, with condition if he yield up the lands the fine to be remitted. ": I have been much impressed with the scrupulous care with which at least superficially, the rights of the Indians were guarded both in Massachusetts and Plymouth colonies. The history of the purchase from the Indians of the territory about the month of the Merrimack discloses a watchful solicitude on the part of the community as a whole to treat the aborigine justly if not liberally. In 1639 Colchester, afterwards called Salisbury, was settled and John Bailey was one of the proprietors, having lots assigned to him in first division. Probably he and his son resided in what is now the village of Salisbury soon after 1639. He still retained his holdings up the Merrimack where it would appear he had an exclusive right of fishing, since on January 10, 1642, at a general meeting of the town of Salisbury, it was "Ordered yat ye sole fishing in Powow River shall be out of the hands of John Bailey, Senior, for yt he hath forfeited his right given, in not performing ye conditions on which it was granted him." The conditions which he had broken were doubtless the giving to the town its fair share of the fish. In some way Bailey must have satisfied the town that he was not to blame, since the next year it was ordered that :John Bailey is granted sole fishing in ye Powow River two years on condition that he shall not join any but townsmen, so that ye fist shall not be carried out of towne, and he is not to have more than his share of the alewives, and is use ye wyers to ye full height, so that the towne may not suffer by the fish escaping." About 1650 John Bailey, who was then an old man, went to live with his son John Bailey in Newbury. Evidently the fact that he was living apart from his wife was a scandal in the community. In September 1651, the matter was brought before the Court, and John Bailey was tried and sentenced as follows: "That he is injoined to return unto his wife by next summer or send for his wife to come over to him." He never went, and if he sent she never came. He died two months later, on November 2, 1651. That he wished his wife to come to him is manifest by his will, by which he directs his son John to pay his wife six pounds "if she comes over." To his son Robert he leaves fifteen pounds, and to his daughters ten pounds a piece, "if they come over to New England," and five pounds if they do not. They evidently preferred the five pounds to coming over. In this will he mentions John Emery (Senior) as his "brother," which suggests that his wife may have been a sister of John Emery, in which case you are six times an Emery. John Bailey is a rather pathetic old fellow with whom the world seemed on the whole to go somewhat awry. John Bailey, the second of the name, was born probably at Chippenham about 1613, and came over with his father. In the first allotment of lands in Salisbury hew was granted a homestead. He married Eleanor Emery, a daughter (probably) of John Emery. He was taxed in Salisbury in 1652, 1653, and 1654, and owned land there in 1658. Just when he came over to Newbury side to live is uncertain. He was living there apparently in 1651 when his father died. He settled "on the plain a quarter of a mile from Deer Island." In 1652 he had a dwelling house and twenty acres of lad, which in 1653 he sold to Joanna Huntington. [his sister]. In 1669 he took the oath of allegiance, and again in 1678. He was elected Constable several times, and was a Selectman in 1673 and possibly during other years. He died in March, 1691, and his widow Eleanor died in 1700. Isaac Bailey, the son of John Bailey second, and Eleanor Emery, was born July 22, 1654, and married Sarah Emery, the daughter of John Emery, Junior, June 13, 1683. He died April 25, 1740."